Discussion How to connect my Ubuntu to internet?? How to connect my Ubuntu to internet?? I have installed today Ubuntu 8.04.1 as guided by the moderator M Fillpot. Now i need to connect to internet via a DSL connection. Please help me by giving me a step by step description as i am newbie totally. People should learn to use google. I know, people maybe can't to use google but it's faster than write here at forum. If you can't to find what you need then can ask it us. We are friendly to people and always we help to people but don't ask simple questions. I know you have probably used the guide that arochester used, but here is some information anyway. Most DSL internet connections are run through a modem/router that you keep at your house/business, any computer that connects to that router in then connected to your local area network and does not need additional software to connect to the internet. 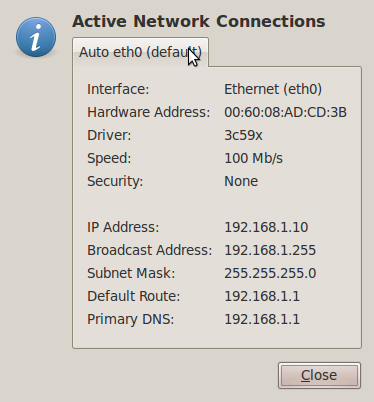 Once your system is connected to the router via wired or wireless connection you only need to go into the gnome-network-manager to choose which connection you want to use and the option for the network device if necessary. but now the problem facing is it is not showing any icon or such thing to indicate that connection is on. even the icon at the panel is showing > No connection. What i mean to say is windows provides the facility to monitor the network status by allowing us too see the duration, speed and the most important thing - bytes sent and received. Is there any such thing in ubuntu?? Of course, go to System - Administration - System monitor - Resources and there is Network history and actual receiving and sending. If you right click on the network manager applet and click on connection information it will give you the basic connection information as shown below. And if you go to system -> Administration -> System monitor you can view the bit and transfer details as shown below. You just play with ubuntu and will find everything. Now i m facing some more problems with the networking in ubuntu. 1.using the command terminal i get connected to internet but even then the nm-applet in the panel for network connections is showing "NO CONNECTION"
2.by network gets automatically disconnected while working on the internet. I need to again use the terminal to disconnect and reconnect it.when i disconnect it using the "poff" command,it interrupts saying that more than one are running. so then i use "poff -a". at this point I would recommend installing wicd instead of the gnome-network-manager, wicd allows you to choose connection, change connection preferences and disable connections from the gui control panel.